Each year, a quarter of a million people visit Chimney Rock State Park, opting to climb the stairs or ride the 26-story elevator to the pinnacle of the 535 million-year-old monolith for epic views of Hickory Nut Gorge. But in 1875, when traveler Edward King first spied the “antique and weather-beaten castle turret,” he could only admire it from afar. “Everywhere Nature seems to have thrown out barriers, determined to prevent one from entering her favorite retreat,” King wrote. 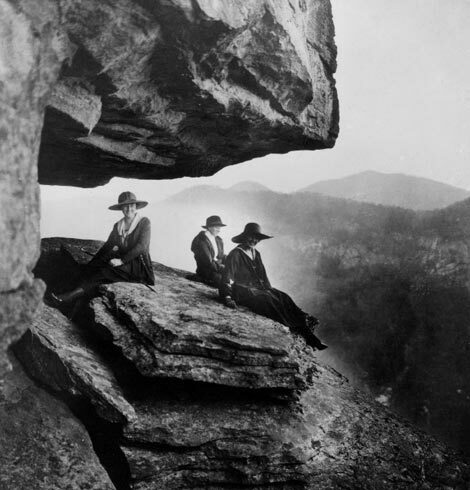 By the time Dr. Lucius B. Morse purchased Chimney Rock in 1902, a stairway to the 2,280-foot precipice had been in use for 17 years, installed by the previous owner, Jerome Freeman. Yet as time, weather, and increased visitation took a toll, the need for new stairs and expanded access to Hickory Nut Falls and other viewpoints called for a proper trail system. Lucius hired carpenter Guilford Nanney for the ambitious task. “Mr. Nanney says that he can take ten men and build a first-class 4-foot trail from the parking place to the bottom of the falls,” Lucius recorded in a ledger, adding that the job could be done in two weeks for $200. The result was an astounding network of trails, ladders, and 472 steps that wound through the rocks, grottoes, and across ledges to reach the multiple overlooks. Nanney spent the 1920s, ’30s, and ’40s constructing and maintaining the buildings and trails, some of which are still in use today. Before he got the position at Chimney Rock, Nanney, who was born in Henderson County in 1871, supported his wife, Mary Merrell, and their four girls by working as a farmer and carpenter-builder. “Guilford Nanney traveled the countryside building the tall houses he saw in his head,” wrote architectural historian Barbara Miller Lane in her book Housing and Dwelling: Perspectives on Modern Domestic Architecture. “You told him how many rooms you wanted, and he built you a house. That was the transaction. He would not suffer interference and meddling.” Today, several of the Queen Anne-style homes Nanney built in Rutherford County are on the National Historic Register.